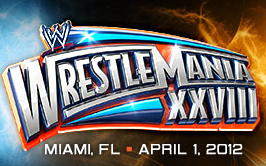 The four main even matches are now set for Wrestlemania 28. Over the next six weeks, WWE will be promoting these matches in an attempt to get viewers to fork over $50 or more to watch the biggest Wrestlemania ever live on pay per view. The cynic in me thinks by the time April 1 rolls around, I’m going to be tired of seeing the same guys in the ring. So I’d like to use this blog to suggest how I would go about building up the matches. This is a relatively fresh match up. I’m sure they wrestled before, but off the top of my head, I can’t remember when they were in the ring together for a one on one match. Given WWE’s track record, it’s probably safe to say Punk and Jericho will be on the opposite side of the ring in some tag team matches over the next few weeks. To me, this is the wrong path to take. Punk and Jericho should never be in the same ring together. In fact, CM Punk shouldn’t wrestle on TV until Wrestlemania. The 30-day title defense clause should be waived (not that it’s ever enforced) and Punk should only cut promos or be on commentary during Jericho’s matches. Punk could claim he’s been a fighting champion and is using the next six weeks to rest up and be closer to 100% healthy for the biggest match of his career. Jericho on the other hand should be hell bent on proving he is the “Best In The World” by taking on anyone willing to step into the ring. While I don’t necessarily like this idea, given how little value is placed on the US title at moment, I’d have Jericho beat Jack Swagger but instead of pinning Swagger, Jericho pins himself. After the match, Jericho tells Swagger he could have taken the US title, but the only title he cares about is CM Punk’s WWE title. Chris Jericho hasn’t done anything since returning to WWE. If he’s going to be in a high profile match, he needs to be re-established as a threat. Have Jericho tear through the undercard to show dominance and give the audience the feeling Y2J could take the title at Wrestlemania. I know one of the biggest problems in WWE is the lack of star power and by having Jericho run wild over guys isn’t going to help that problem. But this is the build up to Wrestlemania. If you’re not in a meaningful match on Wrestlemania, you can’t really be damaged any more than you already are at this point in time. After Wrestlemania, WWE should start building up new stars. Now is the time to promote guys in matches fans are going to pay to see. I’m willing to bet last year’s Wrestlemania United States title match between these two guys won’t be mentioned during the next six weeks. I find it funny and sad that a match not even important enough to make it onto the PPV last year is now being redone for the World Title. I can only think this was a last second decision and not a match that was planned for in advance. I still wish they would have kept the title on Mark Henry and had Daniel Bryan cash in his Money In the Bank briefcase at Wrestlemania to set up a David and Goliath storyline. But I suppose Henry’s injuries changed the plans. One thing I do not want to see in this match is the addition of Randy Orton. Should Orton be medically cleared to wrestle at Wrestlemania, I’d rather see him and Wade Barrett (if his elbow injury is also cleared) settle their feud or I’d settle for Randy Orton vs. Tyler Reks. Just keep Orton out of the title match. Let Bryan and Sheamus have the spotlight. I’m not sure how I’d book the build up for this match. One on hand I think Sheamus should look dominant while Bryan keeps his current cocky escape by the skin of his teeth character going to make the fans believe Sheamus will walk out of Wrestlemania as champ only for Bryan to shock the world and keep the title. Just like Punk and Jericho though, I don’t want to see these two in the ring with each other week after week. I want to anticipate them finally wrestling after weeks of hype. Loyal readers know I’m not fond of this match. I don’t have the desire to re-watch a match I feel was horribly overhyped last year and the way the match came to be was essentially the same way the Undertaker matches for the last 2-3 years have been set up. I find it to be lazy booking. If this ends up the last match for both guys, then I can agree fighting each other is the way to go out, as they are the last of the Attitude Superstars left on the roster. For fans excited about this match, answer me this, the Attitude Era ended 10 years ago, what’s the difference between WWE doing this match and TNA doing Sting vs. Hogan? Now that the match is set, hopefully we can stop with the way too long and meandering promos. I don’t see either guy wrestling before Wrestlemania and really, all that needs to be said is Triple H. vs. Undertaker in Hell in the Cell. Show some videos putting over their history in the Cell and get comments from Shawn Michaels and Mick Foley to talk about the brutality of the match and then the match sells itself. Another match I’m not real excited about. I think John Cena hit the nail on the head on Raw. When April 9 comes around and The Rock is back in Hollywood, WWE will need to focus on the wrestlers who show up every week. While I get the appeal of The Rock returning, that doesn’t mean I agree with it. I was never a huge Rock fan. To me The Rock was the Hulk Hogan to Steve Austin’s Ric Flair, big on charisma but short on wrestling skill. Not that there’s anything wrong with that. It worked for him and non-cynical fans enjoyed his antics. I do think since Rock started making return appearances, he has shown himself to be a one trick pony. He comes out, runs through his catchphrases, makes fun of John Cena’s mangina, and then…. well, that’s about it. The buildup will be a continuation of long promos in the ring and long videos that seem to put over Cena’s dedication to wrestling and Dwayne’s dedication to promoting his movies. Honestly, I feel this match sells itself the same way Triple H and Undertaker sell their match based solely on the names involved. Listening to Rock and Cena trade insults is going to be annoying since the insults seem to be childish and repetitive. Given the lack of star power on the undercard, I would much rather see WWE keep Rock/Cena promotion to less than 10 minutes on Raw while building up other matches. 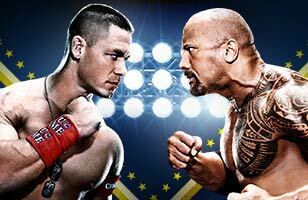 But Rock/Cena is the biggest match in Wrestlemania history so it’s going to be talked about and promoted ad nauseum. Even though I’m less than excited about the last two matches on this list, I know once I step foot into Sun Life Stadium on April first, I will get caught up in the atmosphere and spectacle that is Wrestlemania. I will attempt to lose myself in the moment and have fun with the show. Even if I have to listen to Kevin do his Rock impersonation for four hours. Are you excited by these four main events? What would you do to promote them over the next 6 weeks? Let us know on our Facebook page.